Extension of approval received from Distance Education Council (DEC) for Advanced Diploma in Renewable Energy. Multi-track programme on Water Science and Governance launched in May 2014. Coca-Cola Department of Regional Water Studies launched in May 2014. BLISS - First Summer School launched. First programme held between 15 - 19 July 2013. Distance Education Council's (DEC) visit, inspection and approval of Advanced Diploma in Renewable Energy for three years. TERI University awarded for the 'Most Innovative Curriculum' at the India Today Aspire Education Summit and Awards function. Approval from AICTE received for M.Tech and MBA programmes, to help students avail GATE scholarship from AICTE. Mac Arthur Foundation supported the launch of M.A. (Sustainable Development Practice) programme. TERI University is one of the 10 institutions chosen world-wide, to run this programme. ‘Aahvaan’—the first inter-college festival of TERI University held at the new campus. HSBC: Two scholarships per year for doctoral studies in financial aspects of climate change. IOCL: Two scholarships every year for doctoral studies in biotechnology. New ‘green’ campus inaugurated by The President of India at Vasant Kunj, New Delhi. M.Sc. (Geoinformatics) and M.Sc. (Plant Biotechnology) launched. Student strength goes up to 365. Second Convocation of the University held on 17 November 2008. Prof. Richard C Levin, President, Yale University was the chief guest. A total of seven doctoral and 67 Master's degrees awarded. Academic exchange programme with Yale University (School of Forestry and Environmental Studies) launched with support from the V K Rasmussen Foundation. NHPC extends support to the M.B.A. (Infrastructure) programme. Department of Personnel and Training, Government of India nominates 21 mid-career civil servants to attend the newly launched M.A (Public Policy and Sustainable Development) programme. M.B.A. (Infrastructure) becomes the first Business Administration programme to be launched by the TERI University. First Convocation held on 16 October 2006. A total of eight doctoral and 36 Master’s degrees awarded. Mr Nandan Nilekani, CEO, Infosys was the chief guest and was awarded an honorary doctoral degree. Commenced first master's programmes—M.Sc. (Environmental Studies) and M.Sc. (Natural Resources Management). First batch of 19 Master’s students admitted. The TERI School of Advanced Studies was established as a Trust in 1998 with the purpose of providing academic learning programmes. With TERI as its sponsoring society, TERI SAS focused its attention on developing a set of learning programmes that were both is support of, and were supported by, the research on issues of energy, environment and sustainability being undertaken by TERI. It was envisioned that the academic rigour brought by faculty members would enhance the quality of TERI’s application focused research, whereas the state-of-art research of TERI would constantly freshen up the curriculum of TERI SAS’s programmes and increase its societal relevance. This synergistic relationship would therefore further strengthen both the Institutes and increase their contribution to India and the world. This relationship is enshrined in a memorandum of understanding between TERI SAS and TERI, wherein the two have agreed to share research infrastructure and undertake collaborative research programmes, joint studies and provide mutual support for seminars, symposia and conferences. The purpose and vision for the University was further strengthened in 1999, when the University was granted "Deemed to be University" status by the University Grants Commission and notified vide the Ministry of Human Resources Development, Department of Education, Government of India, notification no. F.9-19/95-U-3 dated 5 October 1999. Since its inception, the Deemed University offers not just world-class education, but also an environment that enables its students to develop fresh perspectives on their subjects of study. This includes regular interactions with researchers, scientists and academicians. The Deemed University's first convocation was held on 16 October 2006, where 8 doctoral and 36 master's degrees were awarded. Mr Nandan Nilekani, CEO and MD, Infosys Technologies, delivered the convocation address, stressing on sustainable development and incorporation of related concepts in higher education. 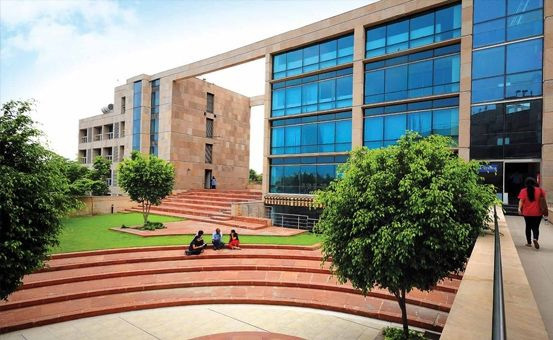 Before moving into the Vasant Kunj campus, the Deemed University was housed in TERI at the Darbari Seth Block of India Habitat Centre from 1998 to 2008. In 2008, the TERI School of Advanced Studies started functioning from its new 'green campus', located in Vasant Kunj- a prestigious institutional area in New Delhi. The new campus has been planned to provide a setting that enhances learning, while simultaneously showcasing the concept of modern green buildings. Recognising the importance of providing international perspectives in its programmes, TERI SAS entered into memorandums of understanding with several international universities aimed at facilitating mutually beneficial exchange of students, faculty, knowledge, resources and ideas. In 2007, the Deemed University launched an academic exchange programme with Yale University (School of Forestry and Environmental Studies) with support from the V K Rasmussen Foundation. Subsequently, in 2008, the University launched another academic exchange programme with Freie University of Berlin, Germany, with support from DAAD (the German Academic Exchange Service). In 2009, four scholarship programmes were set up for students in various programmes at the TERI SAS, funded by Sindicatum Climate Change Foundation, HSBC, Deutsche Bank and IOC (Indian Oil Corporation Ltd.). In 2013, The Coca Cola Department of Regional Water Studies was set up with generous support from The Coca Cola Foundation.